To access the AAA Real Estate Industry Arbitration Rules and Mediation Procedures with the previous version of the Standard Fee Schedule, visit the Archived Rules area of the site -- click here. Real estate-related disputes may occur over a variety of issues such as, but not limited to: the market value for purchase or lease of land or structures on that property; revenue issues including expense reimbursements; operational, occupancy and use issues; real estate commission and title disputes; partnership agreements; and tax, land use and zoning issues, among others. Many of these disputes are resolved through arbitration, which is the voluntary submission of a dispute to an impartial person or persons for final and binding determination. Arbitration has proven to be an effective way to resolve these disputes privately, promptly, and economically. The AAA and its National Real Estate Industry Dispute Resolution Council have established rules for the real estate industry in response to the need for an efficient voluntary arbitration procedure designed to address the unique problems involved in real estate. In addition, we have developed specific residential procedures for select states that have unique requirements. This just in: the Hawaii Intermediate Court of Appeals has issued an opinion in Maunalua Bay Beach Ohana 28 v. State of Hawaii, No. 28175, a case we recently analyzed here. We conclude that (1) Plaintiffs and the class they represent had no vested property rights to future accretions to their oceanfront land and, therefore, Act 73 did not effect an uncompensated taking of future accretions; and (2) Act 73 effectuated a permanent taking of littoral owners' ownership right to existing accretions to the owners' oceanfront properties that had not been registered or recorded or made the subject of a then-pending quiet-title lawsuit or petition to register the accretions. Accordingly, we vacate that part of the PSJ order which concluded that Act 73 took from oceanfront owners their property rights in all future accretion that was not proven to be the restored portion of previously eroded land. We remand this case to the circuit court for a determination of whether Plaintiffs have accreted lands that existed when Act 73 was enacted and, if so, for a determination of the damages they incurred as a result of the enactment of Act 73. Here's the court's opinion by Judge Watanabe, and the concurring and dissenting opinion by Judge Nakamura. Disclosure: we filed an amicus brief supporting the property owners, available here. More, after a chance to read the opinions. In Guggenheim v. City of Goleta (2009) 2009 U.S. App. LEXIS 21313, the court made two important rulings: a challenge to an ordinance on its face, instead of as applied to plaintiffs, could be brought as a regulatory taking claim and a mobile home park rent control ordinance constituted a regulatory taking under Penn Central. Courts have rarely upheld regulatory takings claims, and for a rent control ordinance to be found a taking would appear to greatly expand the possible situations in which a regulatory taking has occurred. In Sunset Sky Ranch Pilots Association v. County of Sacramento (2009) ___ Cal.4th ___ the California Supreme Court reversed the decision of the appellate court, which held that the denial of a conditional use permit renewal was a project under CEQA. Although project denials are generally exempted from CEQA review, the appellate court reasoned that in this case the result of denying renewal of the permit constituted the whole of the action, and therefore, CEQA applied. (See “Court Holds that County Has Power to Deny Conditional Use Permit Renewal, but CEQA Applies”.) The California Supreme Court disagreed. Sunset Sky Ranch Pilots Association, petitioner in this action, obtained a CUP in 1999 for airport operations. Although the airport requested that the CUP span ten years before expiration, the County of Sacramento granted only a five year CUP in anticipation of a new East Elk Grove Specific Plan that could change land uses permitted in the area of the airport. Approximately five years later, the airport requested a renewal of its CUP. The County denied the renewal without conducting environmental review under CEQA. The County claimed that the area surrounding the airport was changing, and the airport would no longer be an appropriate use of the property. Although Petitioner sued the County on various grounds, the only issue addressed by the Supreme Court was whether the denial of the CUP renewal constituted a project, and therefore, CEQA applied. As Congress was tangled in the health care reform debate it let another important decision fall by the wayside: What to do about the estate tax, which, as it stands right now, is set to be repealed for 2010. Earlier this month, the House voted 225-200 to extend the estate tax, setting it at 45% permanently for individual estates worth over $3.5 million -- $7 million for married couples -- instead of allowing the tax to expire at the end of this year and then revert to a higher tax rate of 55% in 2011 with a $1 million exemption. Industry observers expected the Senate to follow suit since no one believed the government would allow the tax to expire altogether and give up the much needed revenue. But the Senate opposed extending the estate tax at its current rate even temporarily, until Congress could come up with a more permanent resolution. Most tax experts believe that at some point next year, Congress will retroactively reinstate the 2009 tax rate of 45% with a $3.5 million exemption for individuals back to Jan. 1. CalHFA is offering a series of Webinar Lender Training sessions to introduce and outline several financing options for first-time homebuyers. You can also learn about CalHFA's policies, procedures, eligibility requirements, documentation and more. See the invitation below to find out how you can register for this free and functional training from CalHFA. The 2007 American Housing Survey data CD is available for order from the HUD USER web store, at http://webstore.huduser.org/catalog/product_info.php?products_id=8330. This CD contains the same data and documentation that are available for download from the AHS web site. We offer the CD because some users like to have one. The Community Development Financial Institutions Fund (CDFI Fund) is seeking reviewers to assist in its review of applications received under the Fiscal Year 2010 funding round of the CDFI Program. Working in teams but reading each application independently and without consultation, reviewers will evaluate the applications using the CDFI Fund’s established review criteria, including such factors as community development performance, business strategy, market analysis, management capacity, and financial health and viability. The CDFI Fund intends to categorize applications received by the type of financial institutions and specialized financing activities in order to then assign applications to reviewers based upon specific expertise. Members of the general public, with considerable expertise in community and economic development finance, are encouraged to submit their resumes to become a reviewer. Individuals who haven’t previously submitted a resume, and are interested in reviewing FY 2010 applications, must submit a resume before 5:30 pm ET on January 8, 2010. All resumes must be sent via email or fax to HR Anew, attn: Dana DeVance (email: ddevance@hranew.com or via fax: 410-381-5229). For more detailed information on CDFI Programs, please refer to the CDFI Program page. WASHINGTON - The U.S. Department of Housing and Urban Development (HUD) today announced that it is charging a Las Vegas real estate broker and two homeowners with violating the Fair Housing Act by denying a mother of seven the opportunity to rent a four-bedroom home because they thought she had too many children. The owners of the house instead rented to a couple with one child. The Fair Housing Act prohibits housing discrimination based on family status, including discrimination based on the number of children. This one-day class discusses FHA appraisal requirements including FHA Appraisal Protocol and equips attendees with the knowledge to review FHA property appraisals and determine property eligibility. Learn about the responsibilities of the appraiser and lender. Appraisers will gain an understanding of what to look for during the site visit and how to report readily observable deficiencies. Topics covered include FHA new construction appraisal procedures, manufactured housing, condominiums, income properties, 203(k), declining markets (Form 1004MC), and sales concessions along with FHA appraisal review and sanction procedures. Approved for seven (7) hours of Continuing Education Credit from the State of Colorado. All Times are MDT. The holiday brings "light blogging" as they say, so instead of a substantive post, we're listing some of our favorite quotations about property rights, eminent domain, and the like. Have any of your own? Send them, and I'll post. Such difficulties indicate that the dichotomy between personal liberties and property rights is a false one. Property does not have rights. People have rights. The right to enjoy property without unlawful deprivation, no less than the right to speak or the right to travel, is, in truth, a "personal" right, whether the "property" in question be a welfare check, a home, or a savings account. In fact, a fundamental interdependence exists between the personal right to liberty and the personal right in property. Neither could have meaning without the other. That rights in property are basic civil rights has long been recognized. But simply denominating a governmental measure as a "business regulation" does not immunize it from constitutional challenge on the ground that it violates a provision of the Bill of Rights. . . . We see no reason why the Takings Clause of the Fifth Amendment, as much a part of the Bill of Rights as the First Amendment or the Fourth Amendment, should be relegated to the status of a poor relation in these comparable circumstances. The power of eminent domain, next to that of conscription of man power for war, is the most awesome grant of power under the law of the land. Although we have been called upon the resolve several rather abstract issues arising under our laws and constitution, we undertake that responsibility mindful that these cases, in a very tangible way, involve a real community, and the real people who live, work and own property there. The Fifth Amendment's guarantee that private property shall not be taken for a public use without just compensation was designed to bar Government from forcing some people alone to bear public burdens which, in all fairness and justice, should be borne by the public as a whole. While the consent of individual officials representing the United States cannot "estop" the United States, it can lead to the fruition of a number of expectancies embodied in the concept of "property" expectancies that, if sufficiently important, the Government must condemn and pay for before it takes over the management of the landowner's property. No, that's it, it's the vibe! In plaintiffs' request for an administrative mandamus challenging an environmental impact report certified by the defendant pursuant to CEQA concerning a transfer of water from a water agency and a water storage district to the defendant's, judgment of the trial court is reversed, vacated and remanded as, although the trial court correctly rejected plaintiffs' principal contentions, it erred in issuing the writ because the EIR contains no material defects. in recent decades, states and localities have turned to a number of regulatory tools — such as smart growth policies, inclusionary zoning (IZ), in-lieu fees for developers, density bonuses, and land use regulations — to expand their stock of affordable housing. For decades, HUD has been a leader in addressing barriers to affordable housing through our research and development efforts, and the latest Cityscape symposium continues this tradition by examining some of the most innovative and popular affordable housing policy tools.1 The following synopsis of symposium articles shows how researchers are exploring the impact of these tools on consumers and local economies. The lead article, “Housing Market Effects of Inclusionary Zoning” by Antonio Bento, Scott Lowe, Gerrit-Jan Knaap, and Arnab Chakraborty, examines the effects of IZ policies on housing prices and starts in California from 1988 to 2005. Adopted to counter the exclusionary zoning once commonly used to keep low-cost housing out of a locality, IZ mandates that a specified share of new residential construction be affordable to low- and moderate-income families. The study found, within the context of the superheated housing market of the 1990s, that IZ boosted the supply of multifamily housing by 7 percent, but increased housing prices 2 to 3 percent faster than in comparable locales. Housing price effects were greater in higher-priced markets, suggesting that builders of single-family units passed on the increase in building costs to home-buyers, especially in higher-end markets. Finally, researchers learned that the size of market-rate houses in cities with IZ grew more slowly, with reduced square footage in less expensive units. Many communities structure IZ to provide alternatives for residential developers who would otherwise be required to include a set allotment of housing priced below market rate within the confines of market-priced projects. In “Evaluation of In-Lieu Fees and Offsite Construction as Incentives for Affordable Housing Production,” Douglas R. Porter and Elizabeth B. Davison examine two such practices. One allows developers of market projects to build the required affordable houses offsite; the other allows them to pay an in-lieu fee to a housing nonprofit or trust fund, which then applies the money toward affordable housing construction at a site of their choosing. The authors studied three communities that instituted these alternatives — Boulder, Colorado; Montgomery County, Maryland; and Pasadena, California. In-lieu fees/offsite options worked well in enabling two of the communities to “produce affordable units in satisfactory locations” while mitigating developer costs. In the third community, however, a perceived lack of transparency in setting fees politicized the program, and the ensuing controversy made in-lieu fees unacceptable to local officials. Can the adverse effects of excessive local land-use regulatory barriers be remedied? In “Removing Regulatory Barriers to Affordable Housing in Development Standards, Density Bonuses, and Processing of Permits in Hillsborough County, Florida,” Sam Casella and Stuart Meck describe a recommended regulatory makeover, (which has subsequently been approved), based on an assessment of the county’s comprehensive plan, land development code, building code, development review process, and interviews with the county’s Affordable Housing Office. The authors focused on three issues: county development standards, such as minimum lot size or housing setbacks that can arbitrarily increase housing prices; the use of a density bonus designed to override code limits on the number and size of houses on a given parcel to realize affordable housing benefits; and the processing of development and building permits, considered a source of uncertainty and delay by homebuilders in many localities. Problems were traced to an elaborate rezoning procedure, narrow targeting of only large-scale developments, and stringent criteria for approval — such as the presence of substandard housing, resident households with low or moderate incomes and proximity to an economic development area that provides employment. The analysis concluded that the county would benefit from substantial downsizing of setbacks and lots, as well as from modifying density bonuses, simplifying permitting, and accelerating development reviews. HousingPolicy.org is an online guide to state and local housing policy developed and maintained by the Center for Housing Policy, the research affiliate of the National Housing Conference. The purpose of HousingPolicy.org is to collect and provide examples of proven solutions for expanding the availability of homes for working families and others in your community. The site includes easily accessible information on a broad range of state and local policy tools, as well as guidance on how to put them together to form a comprehensive and effective housing strategy. While geared to state and local decision-makers, HousingPolicy.org is written and designed for use by visitors of all backgrounds and experience levels - from those completely new to housing policy to veteran practitioners. Photo courtesy of Potterhill Homes. We do not view HousingPolicy.org as the definitive word on state and local housing policy, but rather as a framework for organizing the knowledge and experience of policymakers and practitioners from around the country. To help ensure that this site provides comprehensive, timely, and accurate information, we encourage you to share the wealth of experience that you have accumulated over the years. If you know of promising policies that we have missed or if you think we got anything wrong, please tell us! We also invite you to submit examples or images of successful housing developments in your community. Please note that all of the photos used on the site are of real people and affordable homes, and were supplied by developers, communities, and other housing-related organizations. Why focus on working families? As housing prices and rents have risen, an increasing number of working families - teachers, nurses, fire fighters, and other essential workers - are experiencing difficulty affording their housing costs. Many of these families have incomes that are too high to receive preference for federal housing assistance but too low to benefit from the mortgage interest deduction and other tax policies that promote homeownership. HousingPolicy.org is focused principally on solutions that help these families afford the costs of buying or renting a decent home. However, many of these solutions can be adapted to serve families at other income levels. Click here for more background on the focus of HousingPolicy.org and how the initial policies were selected for inclusion. Click here for links to other organizations that focus on the housing challenges facing households that are poor or homeless, have special needs, or fall within other defined population groups. The initial framework for HousingPolicy.org was developed through a 115-page in-depth analysis of state and local housing policy [PDF] by Jeffrey Lubell, director of the Center for Housing Policy. The results of that analysis were summarized in a handbook, Increasing the Availability of Affordable Homes: A Handbook of High-Impact State and Local Solutions [PDF]. Both the analysis and the handbook were prepared in partnership with Homes for Working Families, a national, nonprofit organization that was dedicated to advancing policy changes that enable more of America's working families to find safe, good-quality homes they can afford. We acknowledge and appreciate their support and insight, as well as our reliance on those earlier materials in preparing HousingPolicy.org; portions of this site have been adapted or excerpted from those earlier works. Click here to order hard copies of the handbook. Click here to help support the development of HousingPolicy.org and other projects of the Center for Housing Policy. HousingPolicy.org was developed with the generous support of the Annie E. Casey Foundation and the John D. and Catherine T. MacArthur Foundation. The Casey Foundation provided funding for the homeownership components of the site, while the MacArthur Foundation funded the rental components. Click on the Foundation logos below to learn more about their work. The U.S. House of Representatives passed on December 16 the Jobs for Main Street Act (HR 2847), which includes over $150 billion in provisions intended to spur job creation and fund various infrastructure and relief programs with targeted investments for highways and transit, school renovation, hiring of teachers, police, and firefighters, and job training. In addition, the bill would redirect funds from the Troubled Asset Relief Program (TARP) to finance other priorities including $1 billion for the National Housing Trust Fund to help build, preserve, and rehabilitate rental homes that are affordable for extremely and very low-income households; and $65 million for project-based vouchers to support units built by the Trust Fund. It would also provide $1 billion for the Public Housing Capital Fund for additional repairs and rehabilitation of public housing. The bill, which was originally introduced by Alan Mollahan (D-WV) in June 2009, passed the House on December 16 by a 217-212 vote. The legislation will now go to the Senate for consideration; however, it is unlikely that the Senate will take-up the bill before the end of the calendar year. It had been reported that the bill could possibly include some of the Low-Income Housing Tax Credit (LIHTC) improvement provisions, including extension of the Section 1602 Tax Credit Exchange program and a five-year carryback provision. None of the LIHTC improvement provisions are included in the House-passed bill. NH&RA will continue to monitor the status of this legislation and will provide updates as information becomes available. Several years ago, The Appraisal Foundation created two Uniform Commercial and Industrial Summary Appraisal Report (UCISAR) forms: one for existing properties and one for small properties. The Appraisal Foundation also published accompanying instructional manuals for each form. It has come to our attention that some appraisers are continuing to use these forms, despite the fact that they have not been updated or supported since 2001. We have occasionally received inquires asking when the forms and/or manuals would be updated, to better harmonize with current USPAP requirements. This is the HUD national homeownership center reference guide mailing list for real estate industry professionals that are interested in updates to HUD Mortgagee letters, notices and guidebooks, & FHA Housing Industry Training. Please visit our homepage at: http://www.hud.gov/offices/hsg/sfh/hsgsingle.cfm Servicing lenders can visit HUD's National Servicing Center at: http://www.hud.gov/offices/hsg/sfh/nsc/nschome.cfm This list does not provide HudHome property listings. Enactment of ML 2009-28, Appraiser Independence, will be delayed until February 15, 2010. ML09-28 (originally planned for a January 1, 2010 implementation) has two parts: a) prohibition of mortgage brokers and commission-based lender staff from the appraisal process, and b) appraiser selection in FHA Connection. The effective date for both sections of this guidance will now take effect for all case numbers assigned on or after February 15, 2010. This extension will provide FHA and lenders additional time to adjust systems to accommodate the changes. ML 2009-51, Adoption of the Appraisal Update and/or Completion Report, states an effective date of January 1, 2010. The effective date is being extended and will now apply to all case numbers assigned on or after February 15, 2010. This extension will provide additional time needed by FHA and lenders to adjust their systems to accommodate use of the form. landfills for cleaner fleet operations. A liquified natural gas storage tank at the Altamont Landfill near Livermore, Calif., can hold 15,000 gallons. aste Management, Inc., and Linde North America, part of The Linde Group, a global gases and engineering company, announced November 2nd that their joint venture company has begun producing clean, renewable vehicle fuel at its facility at the Altamont Landfill near Livermore, Calif. The facility is the world’s largest landfill gas (LFG) to liquefied natural gas (LNG) plant. 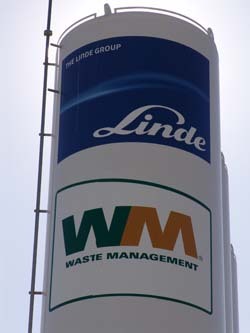 The plant, which Linde built and operates, purifies and liquefies landfill gas that Waste Management collects from the natural decomposition of organic waste in the landfill. The plant is designed to produce up to 13,000 gallons of LNG a day – enough to fuel 300 of Waste Management’s 485 LNG waste and recycling collection vehicles in 20 California communities. Since the commissioning process began in September, the plant has produced 200,000 gallons of LNG. A Massachusetts attorney is accused of using his legal skills to identify properties that were about to be sold and then recording documents to make it look as though a fake company he created held the mortgage on them. But before Leon Gelfgatt could collect the $1.3 million in mortgage payoffs that he allegedly hoped to steal through this scheme, he was arrested, according to the Boston Herald. Charged with attempted larcency and uttering, he is expected to be arraigned today in Cambridge District Court in Medford, reports the Boston Globe. Neither article contains any comment from Gelfgatt or his lawyer. He is a Marblehead personal injury lawyer, the Boston Business Journal reports. An investigation by the state attorney general's office and state police is ongoing, states a press release from Attorney General Martha Coakley. "At this time," it says, "investigators believe that Gelfgatt may have fraudulently reassigned numerous other mortgages." Washington, D.C. – Nearly every family, farmer and small business in America will be exempt from paying any estate tax under the bill authored by Congressman Earl Pomeroy and passed by the House today. H.R. 4154, the Permanent Estate Tax Relief for Families, Farmers, and Small Businesses Act of 2009, would make permanent the 2009 estate tax exemption level of $3.5 million for an individual ($7 million for a married couple) and a maximum tax rate of 45%. Additionally, the bill maintains the so-called “step-up in basis” tax rules, which protect many heirs from paying additional capital gains taxes on inherited assets. For calendar year 2009, the estate tax exemption amount is $3.5 million ($7 million total for a married couple) and the maximum tax rate on estates is 45%. H.R. 4154 would permanently extend this estate tax exemption amount and tax rate. Absent this change, the estate tax is scheduled to enter one year of full repeal in 2010 followed by a return of the estate tax in 2011 with much lower exemption amount ($1 million) and a much higher maximum tax rate (55%). In addition, the one year of estate tax repeal was coupled with enactment of so-called “carryover basis” tax rules, which will require heirs in 2010 to pay capital gains taxes on inherited assets based on the decedent’s original purchase price. Under step-up in basis rules, continued under H.R 4154, the value of the asset is calculated at the time of the decedent’s death. Preserving the step-up in basis rules will protect small businesses from paying an estimated $34 billion in capital gains taxes. This bill is good for farmers and small businesses. According to the United States Department of Agriculture’s Economic Research Service, the $7 million exemption for couples will help the vast majority of family farmers, as the average farm household net worth ranged from $586,000 for small farms to $2.2 million for very large farms in 2008. Only 100 small business and farm estates would owe any estate tax in 2010 if the 2009 rules were extended, according to the Center on Budget and Policy Priorities. “By making the 2009 estate tax level permanent, we will make the estate tax go away for 99.75 percent of all percent of families, farmers, and small businesses in this country. It’s time to resolve this issue once and for all, and this bill is the fair way to do it,” Congressman Pomeroy added. As a reminder, the 2010-11 edition of the Uniform Standards of Professional Appraisal Practice (USPAP) becomes effective on January 1, 2010. Therefore, we want to take this opportunity to strongly encourage all appraisers to review the Appraisal Standards Board’s 2009 Summary of Actions document, which can be downloaded from our website by clicking on the following link: http://www.appraisalfoundation.org/s_appraisal/bin.asp?CID=3&DID=1359&DOC=FILE.PDF. Because there have been questions from appraisers and users of appraisal services regarding this particular new requirement, the Appraisal Standards Board issued a series of questions and answers in its April 2009 USPAP Q&A document. This document can also be downloaded from our website by clicking on the following link: http://www.appraisalfoundation.org/s_appraisal/bin.asp?CID=12&DID=1351&DOC=FILE.PDF. The Board will also add additional Q&A’s for publication this month on this same topic. We are providing you this information with the intent of keeping you as up-to-date as possible regarding USPAP requirements. If you have any questions or need additional information, please feel free to contact John Brenan, Director of Research & Technical Issues at (202) 624-3044 or john@appraisalfoundation.org. To purchase a complete copy of the 2010-2011 USPAP at a special discount, please see the information below. NY Times Editorial On Eminent Domain: Columbia Case "Completely Out Of Step With Eminent Domain Law" And Is "Weakly Reasoned." Really? A New York State appellate court has misguidedly put a roadblock in the way of Columbia University’s expansion plans, ruling that the state misused eminent domain to help Columbia assemble the land it needs. This decision conflicts with the relevant law and will make it much harder for the university to move ahead with a project that would benefit the surrounding neighborhood and the entire city. The editorial is referring to Kaur v. New York State Urban Dev. Corp., 2009 NY Slip Op 08976 (Dec. 3, 2009), in which the New York Supreme Court, Appellate Division (First Department) struck down the attempted taking of land north of Columbia University in New York City because of the record reflected the condemnor's claim the properties are "blighted" was a pretext to mask overwhelming private benefit. The Kaur court undertook an extensive review of the facts and concluded "there is no independent credible proof of blight in Manhattanville." The [Kaur] decision is completely out of step with eminent domain law, including a recent 6-to-1 decision from the New York State Court of Appeals, the state’s highest court. That court ruled that Brooklyn’s Atlantic Yards, a commercial development, can use eminent domain to secure land to build new housing and a basketball arena for the Nets. That was the right decision, and the case for Columbia is even stronger. It should not be a huge surprise that the Times ends up cheerleading for the wrong team in both of these cases. As you may recall, the paper was the private beneficiary of a similar eminent domain action (as noted here), so at least it cannot be accused of being inconsistent. But let's give the editorial board the benefit of the doubt and assume that its opinion wasn't driven by crass self-interest, but by a genuine belief that the Kaur decision "conflicts with the relevant law." The "relevant law," as correctly noted by the Kaur court, is the U.S. Supreme Court's decision in Kelo v. City of New London, 545 U.S. 469 (2005). While that decision has been rightly and roundly criticized (repeatedly by this blog), it is the controlling law and sets a "baseline" below which no state court's interpretation of its state's eminent domain law can fall. Id. at 489. Nor would the City be allowed to take property under the mere pretext of a public purpose, when its actual purpose was to bestow a private benefit. A court applying rational-basis review under the Public Use Clause should strike down a taking that, by a clear showing, is intended to favor a particular private party, with only incidental or pretextual public benefits, just as a court applying rational-basis review under the Equal Protection Clause must strike down a government classification that is clearly intended to injure a particular class of private parties, with only incidental or pretextual public justifications. A court confronted with a plausible accusation of impermissible favoritism to private parties should treat the objection as a serious one and review the record to see if it has merit, though with the presumption that the government’s actions were reasonable and intended to serve a public purpose. Id. (Kennedy, J., concurring). This is exactly what the Kaur court did when it concluded the agency's claim of blight lacked any "evidence whatsoever." When the Times castigates the Kaur opinion as "weakly reasoned," you have to wonder whether the editors read the same decision we did, since all Kaur did was look at the facts. Unlike Goldstein, the Kaur court did not ignore Kelo's baseline and refuse to even look at the facts in the record. Goldstein washed its hands of the inquiry, holding that courts must accept an agency's determination that a parcel is in fact blighted. How Goldstein's interpretation of the New York Constitution's public use clause is above Kelo's Fifth Amendment baseline was never explained by the court. In this case, the record overwhelmingly establishes that the true beneficiary of the scheme to redevelop Manhattanville is not the community that is supposedly blighted, but rather Columbia University, a private elite education institution. These remarkably astonishing conflicts with Kelo on virtually every level cannot be ignored, and render the taking in this case unconstitutional. At least two other courts -- the District of Columbia and Hawaii -- have viewed the Fifth Amendment and Kelo similarly, holding that the Public Use Clause reserves the question of whether a particular use or purpose is in fact the reason for a taking for judicial review. See Franco v. Nat'l Capital Revitalization Corp., 903 A.2d 160, 169 n.8 (D.C. 2007) ("appply[ing] the decision of the Kelo majority, written by Justice Stevens," a claim of pretext should be taken seriously and a court has the power of judicial review); County of Hawaii v. C&C Coupe Family Ltd. P'ship, 198 P.3d 615, 644 (Haw. 2008) ("However, both [Haw. Hous. Auth. v.] Ajimine[, 39 Haw. 543, 550 (Terr. 1952)] and Kelo make it apparent that, although the government's stated purpose is subject to prima facie acceptance, it need not be taken at face value where there is evidence that the stated purpose may be pretextual."). [Disclosure: we represent the property owners in the Coupe cases.]. These cases stand somewhat apart from other pre- and post-Kelo decisions which hold that the public use clause in a state constitution provides greater protection to property owners than does the Fifth Amendment. Cf., e.g., City of Norwood v. Horney, 853 N.E. 1115 (Ohio 2006) (economic development alone will not support a taking under the Ohio Constitution); County of Wayne v. Hathcock, 684 N.W.2d 765 (Mich. 2004) (same, under the Michigan Constitution's public use clause). Both Franco and Coupe concluded that the Fifth Amendment and the majority opinion in Kelo require meaningful judicial review. Kaur now joins them. Thus, the Times editorial is 180 degrees off the mark: it is the Court of Appeals' abdication of the rule of law in Goldstein -- and not the the Appellate Division's opinion in Kaur -- which "conflicts with the relevant law," and which is is "completely out of step with eminent domain law." The federal financial institution regulatory agencies held a free interagency telephone seminar on the attached Policy Statement on Prudent Commercial Real Estate Loan Workouts (Workout Guidance) on Thursday, December 3, 2009. Audio and transcripts are now available. Opportunity with leading mortgage provider: 7 - 10 years experience with appraisal review or valuation of single family, 2-4 family, condominium, cooperative, land trusts, leasehold and factory built properties. Certification and/or licensing preferred. Non-local candidates welcome!! Do you know someone who may be interested? $250 referral fee given for all successfully hired candidates. US Citizen or GreenCard holder candidates ONLY. For more details please contact me directly: 312.962.6909 or celam@starpoint.com. To read this mortgagee letter and any attachments in their entirety, please visit: http://www.hud.gov/offices/adm/hudclips/letters/mortgagee/ view the 2009 letters and click on the letter of your choice. Mortgagee Letters from previous years can be found on the same page. December 16, 2009 – FHA Refinance Webinar. Due to high demand we have added a second FHA Refinance Webinar. Registrants will receive an e-mail confirmation prior to the webinar with a web link, a toll-free dial-in number, & instructions for participating in the training. Registrants must have Internet access. ALL TIMES ARE MST. Registration required, no fee. More info at: http://www.hud.gov/emarc/index.cfm?fuseaction=emar.registerEvent&eventId=328&update=N Register today, this free online training event will fill up fast. Notice 2009-96 provides guidance as to the corporate bond weighted average interest rate and the permissible range of interest rates specified under § 412(b)(5)(B)(ii)(II) of the Internal Revenue Code. It also provides guidance on the corporate bond monthly yield curve (and the corresponding spot segment rates), the 24-month average segment rates, and the funding transitional segment rates under § 430(h)(2). In addition, this notice provides guidance as to the interest rate on 30-year Treasury securities under § 417(e)(3)(A)(ii)(II) as in effect for plan years beginning before 2008, and the minimum present value segment rates under § 417(e)(3)(D) as in effect for plan years beginning after 2007. Notice 2009-96 will appear in IRB 2009-52 dated Dec. 28, 2009. A New Cityscape Has Arrived! The public policy debate on immigration in the United States gains empirical depth and momentum in the newest issue of Cityscape (Vol.11, No.3), published by HUD's Office of Policy Development and Research. Authors of the articles in this symposium offer original, scientific research aimed at answering such questions as: Why do some immigrants become citizens while others do not? How does immigration affect metropolitan economies? Where do immigrants cluster, and why? How do immigrants go about certain aspects of their daily lives, such as commuting? Kim Manturuk, Mark Lindblad, and Roberto G. Quercia on Homeownership and Local Voting in Disadvantaged Urban Neighborhoods. The "Departments" section of the new issue contains important background papers on the past, present, and possible futures of Fannie Mae and Freddie Mac; the curious geographic discrepancies between high residential and commercial vacancy rates; the availability and characteristics of a large and unique panel of data on low- to moderate-income and minority mortgagors; and new techniques for improving the performance and reducing the cost of house framing.